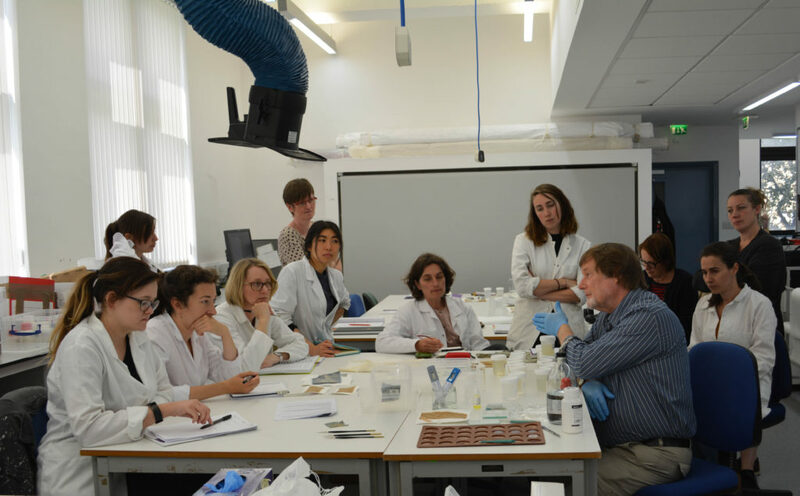 We were delighted to host the course ‘New Methods of Bathing and Stain Removal for Textiles’ with Richard Wolbers this week. Over the 3 days of the course the 16 participants were informed, enlightened and challenged by the new approaches being offered for consideration. 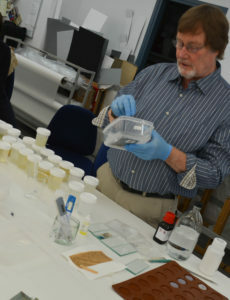 The principle focus of the first day was an examination of basic aqueous cleaning techniques for textile substrates. The principle aqueous cleaning ‘tools’ were introduced; in particular the importance of knowing and controlling the pH and conductivity of surfaces and solutions so that ‘isotonic’ bathing can be considered and the use of simple buffered and chelate-containing bathing systems. 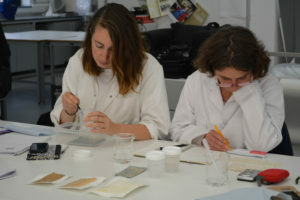 A compelling case was made for a revision of the ‘conventional’ order of thinking considered by most textile conservators in engineering cleaning formulations, especially the role of and reliance on surfactants as the primary wash bath additive. 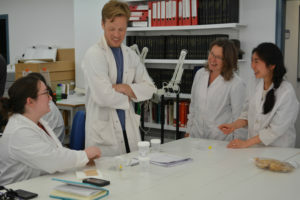 Days two and three built on these systems, covering surfactant chemistry, discussing how ‘spot’ treatments or stain removal can be carried out using simple aqueous gelling materials as well as delving into oxidation-reduction chemistry. Practical methods of making emulsions and micro-emulsions for blending solvent and water cleaning systems were introduced and their important role as a broad spectrum cleaning device was examined. A very visual demonstration of the soil removal achieved by different aqueous bathing system © University of Glasgow, 2017. Making and applying Xanthan gel macro emulsions © University of Glasgow, 2017. Richard Wolbers demonstrating the extremely non-polar properties of a silicone solvent © University of Glasgow, 2017. The practical sessions were a great opportunity for sharing and experimenting © University of Glasgow, 2017. The combination of morning lectures and afternoon practical sessions was ideal in both explaining and demonstrating the rationale for the new approach – the theory sessions were full of information, delivered with Wolbers’ trade mark patient, accessible and inclusive style which engaged even the least scientific and most ‘traditional’ amongst us (that would be me!). The follow up practical sessions allowed participants to put principles into practice: to apply, experiment, discuss and clarify in order to consolidate their knowledge and gain a meaningful understanding of the techniques and their practical application. The small number of participants from a wide range of experiences (and indeed nationalities) encouraged lively discussion and sharing of information, and the excellent course leadership and organisation meant that the maximum learning was gained from the time available. Course material, samples and notes will be really useful resources for future reference. Overall, the workshop was thoroughly worthwhile: inspiring, enjoyable, thought provoking and challenging (in a good way). 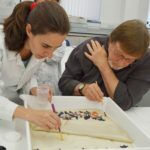 I am sure we have all come away with our heads bursting with information to be processed, tested out and revisited but I am confident that the approaches will advance our conservation practice and that many of the new techniques will be valuable tools in the complex task of cleaning historic textiles. Discussions at the beginning of the practical session © University of Glasgow, 2017. Special thanks to Richard for generously sharing his knowledge and expertise and his patience in answering our many questions and Jim Black of IAP for excellent organisation of the event.